Designed for accounts payable and accounts receivable with debit, credit and balance columns. Sheets promote quick and easy accounting task results. Green color is easy on the eyes. Note: A minimum quantity of 65 must be ordered, and in units of 5 thereafter. National Four-Ring Binder Refill Sheets, 5 x 8 1/2, 100/Pack - Refill pages are designed for use in the Rediform Loose-leaf Ledger Outfit. 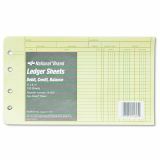 Hole-punched sheets include debit, credit and balance columns on eye-ease green paper.